Welcome to StarKidz Dance Studio! 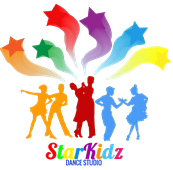 StarKidz Dance Studio was created as a premiere ballroom dance studio for children. All the parents, without exception, want to see their child successful and talented. We are here to guide kids of all ages and enrich their lives. Please complete the following registration form. • Membership tuition depends on season or sessions. • Accounts not paid by the 10th of the month are subject to a $20.00 late fee. Arrangements can be made for special circumstances . • We accept Cash, Check and Credit Cards for payment. CHECK: Checks can be mailed, given to the studio director/instructor. If the name on the check does not match the dancer's name, please make note on the memo line. A $30 fee will be charged for all returned checks (NSF). StarKidz Dance Studio ,their officers, officials, agents, and/or employees, other participants, sponsoring agencies, sponsors, advertisers, and if applicable, owners and lessors of premises used to conduct the event ("RELEASEES"), WITH RESPECT TO ANY AND ALL INJURY, DISABILITY, DEATH, or loss or damage to person or property, WHETHER ARISING FROM THE NEGLIGENCE OF THE RELEASEES OR OTHERWISE, to the fullest extent permitted by law. This is to certify that I, as parent/guardian with legal responsibility for this participant, do consent and agree to his/her release as provided above of all the Releases, and for myself, my heirs, assigns, and next of kin, I release and agree to indemnify and hold harmless the Releases from any and all liabilities incident to my minor child's involvement or participation in these programs as provided above, EVEN IF ARISING FROM THEIR NEGLIGENCE, to the fullest extent permitted by law. • Students who arrive more than 25 minutes late may be asked to observe class. • If injured, tell instructor prior to class...work slowly & carefully or observe. • It is the dancer's responsibility to manage their time so that dance, schoolwork and other outside activities do not conflict.